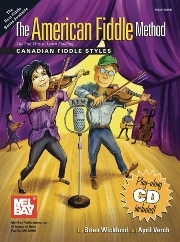 The American Fiddle Method : Canadian Fiddle Styles (2008) Expert fiddlers Brian Wicklund and Canadian fiddle master April Verch teamed up to delve into the dynamic world of Canadian fiddling. This intermediate-level book explores Canada’s rich fiddle traditions including Old Time Canadian, French Canadian, Cape Breton and Métis. More than just a collection of great tunes, this book demystifies common ornaments and bowing patterns used in Canadian fiddling. The authors teach the simple melody to reels, jigs, hornpipes, waltzes, schottisches, airs and strathspeys, and demonstrate how to create variations using the skills in the book. An online download for great play-along audio is included with the purchase. This project is more than just a book of fun-to-play standard Canadian fiddle tunes. It digs deeper into Canadian styles and teaches players how to come up with their own variations using classic ornamentation and bowing patterns. In other words, April Verch and Brian Wicklund bring us not just a “tune book” but a method book. Canadian Fiddle Styles was written to include both beginning/intermediate and advanced fiddlers. Each tune is presented with its basic and easiest melody first. This version has the simplest bowings and little (if any) ornamentation. Following the basic melody, each tune is notated a second and third time demonstrating more advanced ornaments and bowing patterns that are traditional in the region of Canada where the tune originates. This highly anticipated book features traditional tunes from each regional style of fiddling in Canada including Old Time Canadian, French Canadian, Cape Breton and Métis, as well as examples of the various types of tunes in the Canadian fiddling repertoire: reels, jigs, hornpipes, waltzes, schottisches, airs and strathspeys. An extremely exciting bonus to this method is the 60 minute play-along audio that is included with each book. The recording enables players to play along with April and the accompanists (guitar & bass), or to pan the recording so that they are playing along with the accompanists themselves! Reviews from fiddlers you know!